36watt 1meter RGB Lighting washer for internal or external use. Perfect for floodlighting walls of hotels , bars, buildings and other indoor/outdoor places. Excellent build quality, super bright and amazing high quality build. 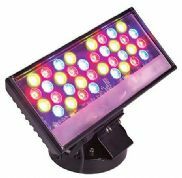 This LED wall washer can work in independent mode or DMX mode and can generate various color changing effects such as flashing, fading, static, seven color jumping synchronously etc. 256 class gray degree dimmer, DMX programable. Thousands of effects available if many LED Wall Washer lights connected together.